Which model of APx500 Series audio analyzers will be integrated into the LabVIEW environment? To incorporate an APx555, APx52x Series, or APx58x Series analyzer into a LabVIEW system, users must employ the APx LabVIEW Driver. APx515 users have the option to use this same driver, or to deploy the LabVIEW DAQ Driver for APx515, and should therefore answer the next question below. 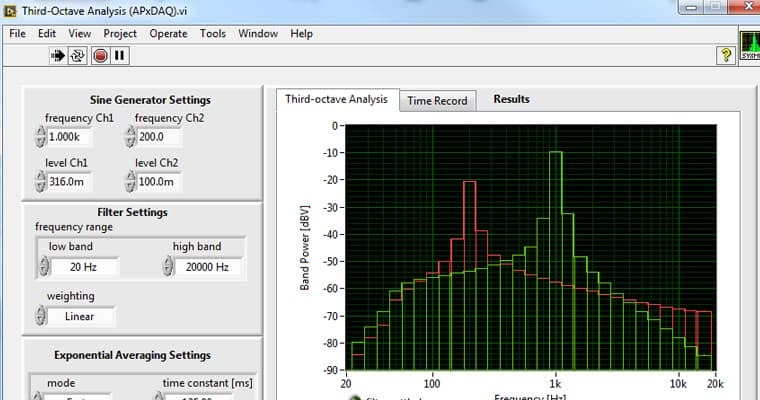 Does the analyzer need to be operated independently from APx500 audio test software? If integration of an APx515 is desired but the analyzer will be operated without use of the APx500 software, then the LabVIEW DAQ Driver for APx515 is the proper driver to deploy. Developed with a broad range of signal acquisition applications in mind, this driver streamlines and simplifies the integration of the APx515 analyzer as a robust, high-quality front end to LabVIEW-based measurement environments. 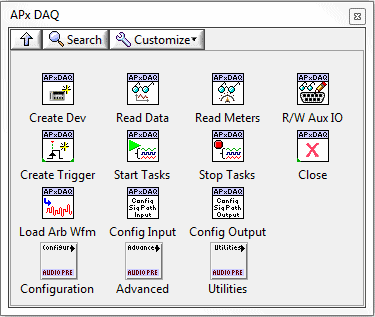 Easy addition of the APx515 to a LabVIEW environment is achieved via the DAQ driver’s collection of Virtual Instruments (VIs)—a function or program created in LabVIEW—for initializing the hardware and configuring a wide range of settings, including input and output channels, sample rates, trigger conditions, signal generation, and signal acquisition. The driver is based on a low-level C++ measurement library, adheres to National Instrument’s standard guidelines for instrument drivers, and has a very small memory footprint. Additionally, it enables control of the APx515 completely independent of the APx500 control software. Figure 1 shows the top-level VIs on the DAQ Driver menu palette, accessed from the Instrument Driver sub-palette in LabVIEW. The APx LabVIEW Driver is a collection of LabVIEW subprograms that enable users to access the functionality available in the APx500 Application Programming Interface (API) with a minimum number of programming steps, using high-level LabVIEW-typical functions. Using the driver, in conjunction with the APx500 software and Microsoft’s .NET, LabVIEW users can develop APx applications with clean, concise LabVIEW code. As mentioned above, the APx LabVIEW Driver is compatible with the APx555, APx52x Series, APx58x Series, and APx515 audio analyzers. The APx500 software has many test automation features built in, including the measurement sequencer, customizable user prompts, lockable projects, and the ability to call external applications. Users that want to go beyond the built-in automation features of APx500 can take advantage of its comprehensive API. The API is built on the Microsoft .NET platform, allowing custom APx programs to be developed in any .NET capable language, including LabVIEW, Visual Basic, C#, and MATLAB. 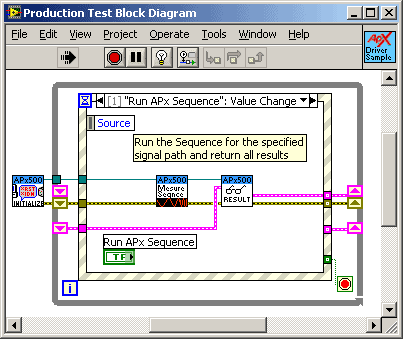 With this driver, LabVIEW users can easily create automated audio test procedures by making simple block diagrams with very little programming (Figure 2). And experienced LabVIEW users will be able to take advantage of LabVIEW’s feature-rich library of front panel controls and indicators to create intuitive and highly customized user interfaces. LabVIEW has thousands of mathematical and scientific functions available, including VIs for waveform generation, waveform conditioning (filtering, DSP, etc.) probability, statistics, and much more. It also has extensive graphing capabilities. Combine this with the APx LabVIEW Driver, which greatly simplifies acquiring and accessing APx audio test data from LabVIEW, and you have a powerful R&D platform. For example, if you want to make polar plots of a loudspeaker’s directivity response, do custom calculations on the spectral peaks from a multi-tone FFT, or plot the spectrogram of a chirp signal, LabVIEW and APx are an effective combination. There’s even a driver VI to get back all FFT points from all channels of the APx signal analyzer measurement. But be careful—the APx supports FFTs up to 1.2M points in size which can result in a lot of data in instruments such as the 16-channel APx586.